The forum and "Big YouTuber" hype machine doesn't usually get to me. Sure, influencers with a million plus subscribers will sometimes rave about a product that piques my interest, but seeing a cringe-worthy shade range or a bad-for-me ingredients list almost always turns me away. I can't say the same for bloggers, Instagrammers, and smaller creators I follow. 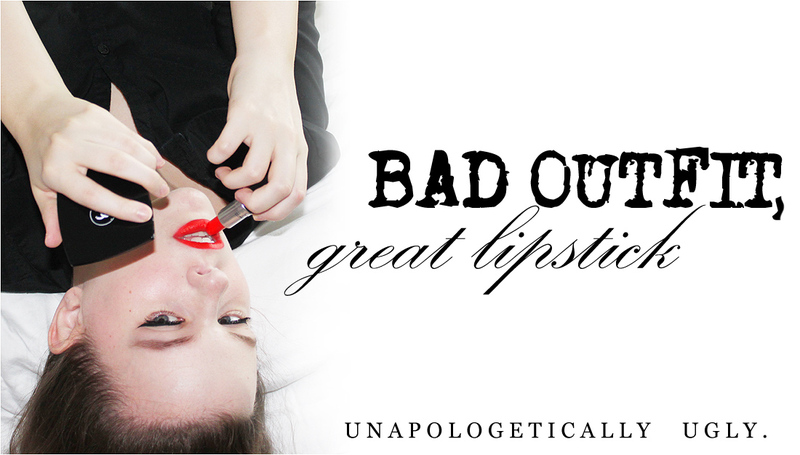 Since they're less likely to be swayed by sponsorships and more likely to use under the radar products that fit my aesthetic, I'm prone to lusting after their favorite products. And when The Critical Babe kept posting about this Make Beauty product that promises both a mattifying cream and a highlighting cream, I was sold. The ability to customize my look? Oooooh! Make Beauty Custom Finish Effects retails for $27. It arrives in a shiny, plastic black compact with a mirror; both attract fingerprints, obviously, but they're easy to clean and have that sleek, simple look I prefer. 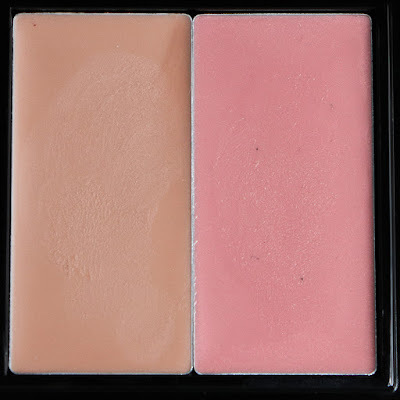 When you open up the compact, you'll see a beige side and a pink side. Because I'm a dipstick used to seeing white or off-white cream highlighters and mattifiers, I initially thought they'd sent me a blush-and-bronzer combo by accident. Double check the instructions, though, and you'll see that they recommend applying the "peach formula to areas in need of shine control or matte finish, and the pink formula to areas in where you want moisture or a dewy finish." It's actually smart to make the two sides completely different colors in the pan so you don't mix them up. Rest assured, they apply clear. 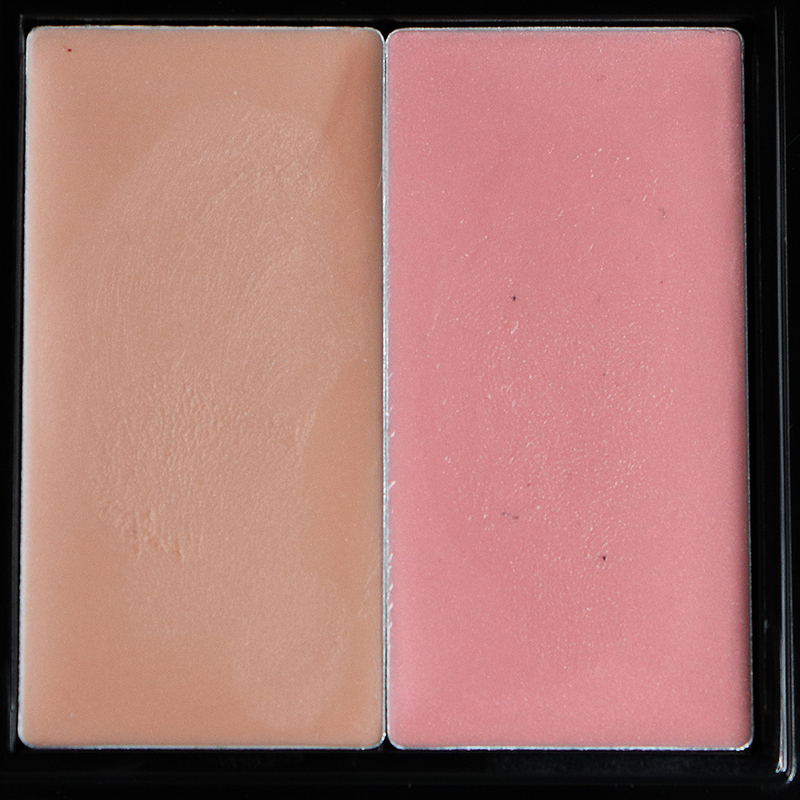 As far as textures go, the matte side has a very thin, silicone-y feel to it, while the pink side feels stickier. Let's talk about the claims. For starters, Make states that this product "will not clog pores" and is "hypoallergenic." Both of these are marketing phrases that don't actually mean much. 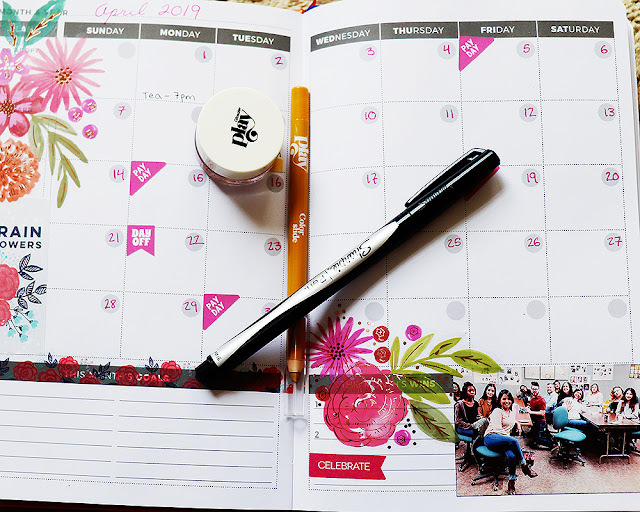 A look at the ingredients list shows a number of components that some people find irritating or clogging, such as talc, ethylhexyl palmitate, and fragrance on the matte side, while the dew side contains various oils, waxes, and more fragrance. I didn't have any issues with breakouts or clogging, but it's worth noting. Make also claims that this product can be used on top of foundation and powder. I found this to be partially true. 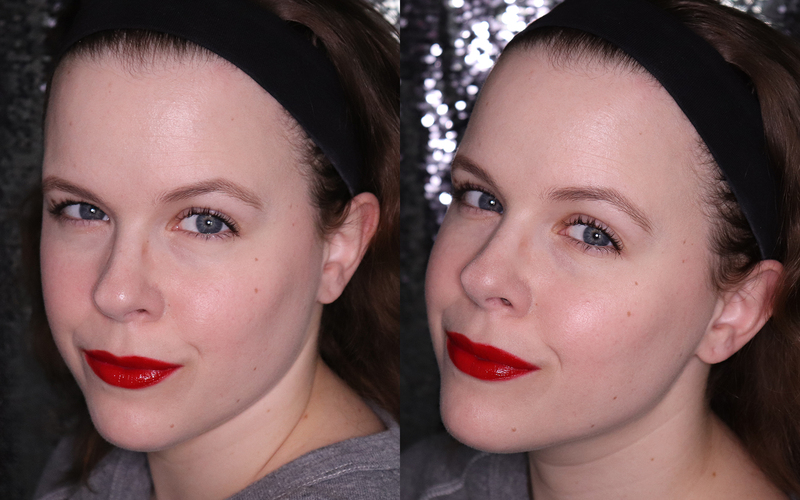 In the above before-and-after photo, you can definitely see that the dewy side (applied to my cheeks) gives a subtle, slightly wet glow. It's somewhat similar to my beloved Glossier Haloscope, though I had to apply more of the Make product to get this look. The matte side, though, didn't work quite as well. If you click on the above photo and look at my nose, you'll see that it gave me a bit of a "polka dot pores" look. This softened a little throughout the day, but it still didn't "reduce the appearance of lines and pores" like Make claimed it would, and it made my nose look a bit patchy and dry. I also applied the matte cream to my eyelids, and while it looked nice for the first hour, it quickly creased all over my lids and "grabbed" flakes from my mascara. These creams also have dramatically different staying power. The dew effect lasted pretty much all day, while the matte effect lasted only a few hours on me, and I say that as somebody with fairly dry skin. In fact, my nose didn't just look shiny after a couple of hours, it looked shinier than usual. I could apply more of the matte side to tamp down the shine, but honestly, I'd have been better off just leaving my nose Make Beauty free. I think the Make Beauty Custom Finish Effects creams work a little better on foundation-less skin. On this day, I went to work with the matte cream on my nose and the dewy cream on my cheeks. With no foundation to butcher, the matte side actually looks okay, but again, it became a grease slick by the time I was done teaching. 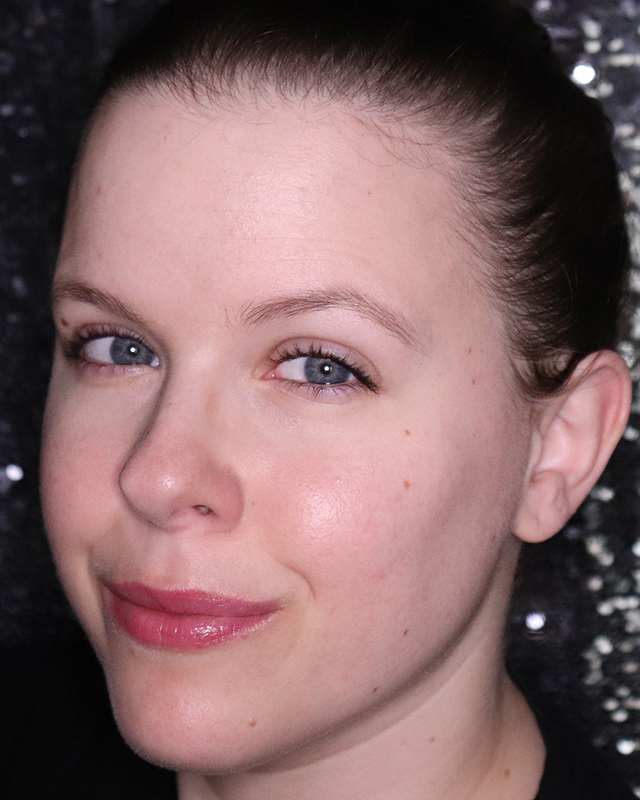 The dewy cream is barely-there, natural, and slightly glowy. So I only like half of this product, and that officially makes it a bust for me. But hey, that half is pretty damn nice. 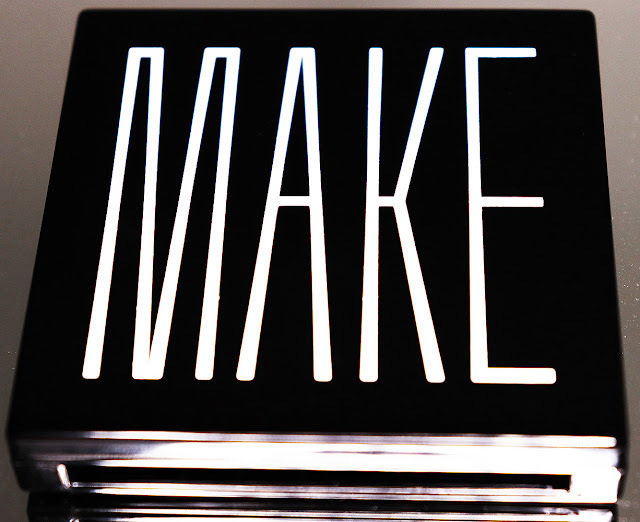 If Make Beauty sells it separately and they come out with a few more products that interest me, I might consider investing. You can never have enough dewy, glossy skin. Make Beauty products are now available on Amazon. I feel like the lid of this is yelling at me, though I definitely agree that making both sides different colours is a great idea. That is something I would need. I am disappointed that the matte side wasn't great. That's something I'm very interested in, even more than the highlight, and the idea of having both sounds like such a promising one. Ha! Yeah, all-caps is definitely eye catching in the weirdest way possible.